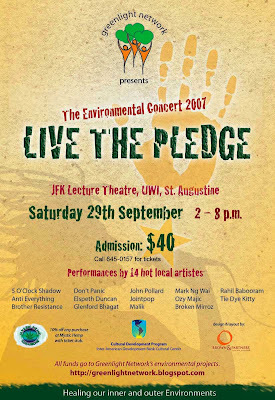 Tickets for Greenlight Network's Environmental Concert 2007: LIVE THE PLEDGE have been printed and are now physically available! We will soon be placing tickets at select locations (to be announced) ... but for now, you can call 645-0157 and arrange to pick yours up from Greenlight's headquarters - 21 Lyndon Street, Curepe. We strongly advise you to do this, since people have already been calling and booking blocks of tickets. You want to be sure that you and your friends get yours! Artistes, the same goes for you. No doubt your family, friends and fans want to come and give support. Make sure they secure their tickets in time. At $40 and for a very good cause (future GLN environmental awareness-raising projects) you can't go wrong! 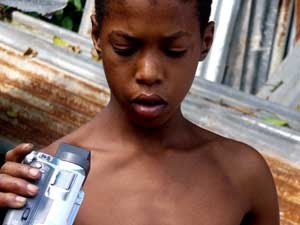 One of the young filmmakers (I SPY Things in My Garden) looks at the LCD screen of the camera. The website for the TIFF (Trinidad & Tobago International Film Festival) is up. Check out the listings and write down dates in your dairy. There are lots of interesting films to take in. Make time to check out the I SPY environmental documentaries which were filmed by varied groups of children age 7 - 10 ( (under the guidance of Elspeth Duncan (see blurb)). 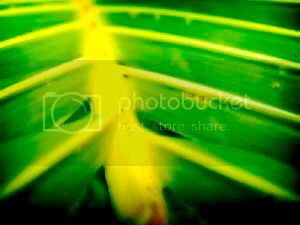 Fresh perspectives and new voices speaking on behalf of Nature. Even though the series was filmed by children, the important and interesting points they bring up (and they ways in which they deliver) are for all ages! 2. The calendar on the home page tells you which episode of I SPY is showing when (from 19th September onwards). They have been slotted into the 11 a.m. - 1 p.m. slots, daily (primarily for young viewers - but of course older ones are welcome :).